Vitamin E (tocopherols) — A substance as important as this ought to be made by the body itself... but isn’t. Vitamin E is a fat-soluble vitamin that exists in eight different forms: alpha-, beta-, delta-, and gamma-tocopherol, and the corresponding tocotrienols. 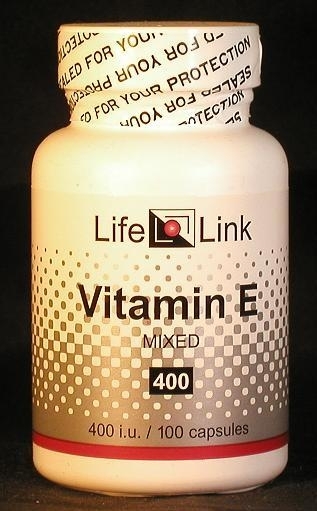 LifeLink’s Vitamin E is a mixture of the four tocopherols. Your body is unable to make vitamin E, so you must get an adequate amount in food or from supplements. The tocopherols are antioxidants which play a role in neutralizing free radical molecules. If free radicals remained unneutralized they would rapidly damage all parts of the body and drastically shorten our lives. The tocopherols may also participate in the synthesis and maintenance of red blood cells. Several studies have cast doubt on Vitamin E’s benefits in preventing heart disease, but they are contradicted by many other studies that have concluded just the opposite. Vitamin E is a fat-soluble vitamin that exists in eight different forms: alpha-, beta-, delta-, and gamma-tocopherol, and the corresponding tocotrienols. LifeLink’s Vitamin E is a mixture of the four tocopherols. Vitamin E is an antioxidant which, in conjunction with other antioxidants, neutralizes free radical molecules which, if left unneutralized, would rapidly damage all parts of the body and drastically shorten our lives. Vitamin E may also participate in the synthesis and maintenance of red blood cells. A substance with such fundamental actions should have broad benefits. Indeed, evidence for the value of Vitamin E supplementation has been shown by scientific studies of: prostate cancer and other cancers, tardive dyskinesia, restless leg syndrome, eye inflammation, preeclampsia, Alzheimer’s disease, rheumatoid arthritis, diabetes, stroke, cataracts, retinopathy, macular degeneration, and male infertility. Recent studies have cast doubt on Vitamin E’s benefits in preventing heart disease, but they are contradicted by many other studies that have concluded just the opposite.